When it comes to adding a sunroom addition to your home, you may have an idea of what you want, but it’s important to know the correct design language when conveying your vision to your design consultant. A lot of preparation goes into adding a sunroom or porch enclosure to your home. From deciding what type of sunroom you want to figuring out which features best fit your lifestyle, it’s important to know what you are looking for before you begin. Here are 10 sunroom features that will help you get started. Patio Enclosures® sunrooms screen rolling panels offer structural integrity and provide maximum visibility without a glare. Our screens are made of nearly-invisible, black-painted aluminum mesh that offer superior strength and resists sagging. Plus, they stay cleaner longer than traditional fiberglass screens. The extruded aluminum frame provides structural integrity for maximum durability and longevity. Screens come standard with all screen rooms and sunrooms. The exception is solariums, where screens are optional. Patio Enclosures’ electrical raceway post comes standard in our four season rooms, but is an optional addition to our three season rooms and screen rooms. The electrical raceway allows you to add interior or exterior electrical features to your sunroom, such as telephones, cables, fiber optics and speakers. Receptacles fit flush into the sunroom or screen enclosure frame for a clean, finished look. Not all sunroom manufacturers offer this feature. Patio Enclosures’ weather stripping is a polypropylene barrier to provide protection and weather resistance. There are varying levels of weather stripping available based on which type of sunroom you choose. Polypropylene Weather Stripping – Used for screen rooms and three season rooms. Polypropylene Weather Stripping with a Fin Seal – Used in Allview Elite three season rooms. Triple Polypropylene Weather Stripping with a Fin Seal – Used in all four season rooms and solariums to provide additional protection from moisture. Standard on all of our rooms, Patio Enclosures advanced weatherlock system adds additional weather stripping where the doors meet for a superior seal against the outside elements, particularly wind and drafts. For additional protection on our AllView Elite three season rooms, four season rooms and solariums, our interlock system provides an extra tight fit between doors to keep the inclement weather out. Patio Enclosures offers several unique roof options for your sunroom. 3-inch or 6-inch Super Insulated Roof System – At Patio Enclosures, our super insulated roof system is one of the strongest sunroom roofs in the industry. Comprised of super condensed foam with an aluminum skin and structural I-beams for support, our roofs can withstand maximum snow and wind loads. Our roofs can also be shingled for a seamless look to match the rest of your home. Our 3-inch roof comes standard on our screen rooms and three season rooms, while our 6-inch roof comes standard on our four season rooms. Gable Roof – A gable roof slopes downward in two parts at an angle from a central ridge, forming a gable at one end. It is also known as a pitched roof or an A-frame. Both of our 3-inch and 6-inch roofs can be utilized to create a gable roof for your sunroom. Single-slope Roof – A single-slope roof has a single, sloping surface and is attached at the building’s highest point off the roof slope. It is also known as a shed roof. It is our most popular and economical option. Both our 3-inch and 6-inch roof panels can be utilized to create a single-slope roof for your sunroom. Custom Wood Roof – Depending on the overall vision for your new sunroom, a custom wood roof is always an option. These roofs tend to be more costly than our super insulated roof system due to the labor and materials needed but can be easily constructed should you so choose. Existing Roof – If you have an existing covered patio, porch or breezeway you’d like to enclose, we can help. Because all of our enclosures are custom designed and custom manufactured for each application, we can design, make and install our products under your existing roof. Comfort-Gard® Glass Roof Panels – If you choose our 3-inch or 6-inch insulated roof system, Comfort-Gard glass roof panels are an add-on option. Similar to skylights, our glass panels allow additional light to come in through the roof. The major difference between our glass roof panels and skylights is the way they are engineered. Our glass roof panels are designed to be flush with your roof to prevent snow and ice buildup that causes leaks in typical skylights. The glass panels are available with both gable and single-slope roof options. Solarium Glass Roof – Unlike sunrooms and screen rooms, solariums have all glass roofs, but there are still options. You can choose between a gable or single-slope roof. Patio Enclosures wants to make sure that your windows and doors roll effortlessly. That’s why we offer a unique window and door rolling system designed specifically for each sunroom. Triple-track with Nylon Tires – Our screen rooms use a triple-track system with nylon tires that never wear out the tracks, providing easy operation of your windows and doors for the life of the room. The triple-track system also allows for an easy upgrade to a three season room without having to change out the frame. Triple-track with Ball-bearing Wheels – Three season rooms are manufactured with a triple-track system that utilizes ball-bearing wheels in the nylon tires to ensure effortless operation. Monorail with Ball-bearing Wheels – Patio Enclosures four season vinyl rooms use a monorail system with ball-bearing wheels in nylon tires which provides easy operation of your windows and doors. Monorail High-compression, European Ball-bearing Tires – Our four season aluminum rooms and solariums use a monorail high-compression, European ball-bearing tire system originally designed for high-traffic European commuter trains. Window and door panels glide quietly and effortlessly, ensuring a lifetime of easy use. Each Patio Enclosures custom sunroom comes with a door handle that is designed specifically for each style of room. Easy-grip Handles – Our easy-grip handles make opening and closing screens effortless. These handles are designed for our screen rooms. Black Aluminum Handle with Wood Accents – This low-profile door handle, used in our three season rooms, is easy to grip and allows blinds to open and close with ease. Color-matched Euro-style Handle – This easy-grip, low-profile handle matches your door frame color and engages or disengages the dual throw bolt locking system with a simple turn. This door handle comes standard in our three season elite rooms, four season rooms and solariums. Your security is important to us. That’s why we offer unique locking systems for each of our sunrooms. Single-point Locking System – Our screen rooms feature easy-to-use, single-point locks that ensure your window and door screen panels lock securely into place. Single-point Locking System with Anti-lift Bar – Our three season rooms feature a single-point locking system with an anti-lift bar, which prevents the window and door panels from being opened or lifted out of the frame, adding security for you and your family. Dual-point Throw Bolt Locking System with Night Latch – Our three season elite rooms, four season rooms and solariums feature a dual-point throw bolt locking system with night latch. This locking system eliminates the need for dead-bolts with the added security of top and bottom throw-bolts. The night latch can also be used to ventilate the room while locking the window and door panels securely in place. Patio Enclosures offers several exclusive glass options for you to choose from when creating your perfect sunroom. All of the glass we use in our sunrooms and solariums is tempered for your safety. Single-pane – Our single-pane glass comes standard in our three season rooms. This option is the most widely used glass and provides you with protection from the elements, while allowing you to enjoy the benefits of solar heat gain. Double-pane Insulated – Our double-pane glass blocks UV rays 44% more effectively than ordinary glass and improves heating and cooling performance better than single-pane glass. Double-pane glass comes standard in our four season rooms and solariums. Comfort-Gard® PLUS High Performance – If you are looking for the most advanced glass available, our Comfort-Gard PLUS high-performance glass may be the right option for you. This glass keeps you warmer in the winter and reduces your cooling costs by as much as 25% in the summer, due to the low-e coating and argon insulating gas. This option is available in all of our sunrooms and solariums. Glass Tint – Our bronze glass tint is an available option with single-pane, double-pane, or Comfort-Gard® PLUS high-performance glass. This warm bronze tint provides your home with shading and UV protection while reducing solar heat gain. The glass or screen panels that form the walls of your room are held in place with a frame, made of either extruded aluminum or vinyl reinforced with aluminum or steel. Aluminum Sunrooms – Aluminum is one of the strongest materials available and is resistant to temperature and humidity, which means it will never rust, warp or rot, providing years of valuable use. Our aluminum is extruded at various thicknesses, depending on the type of room you choose. Our four season rooms feature a thermally-engineered aluminum frame to allow for year-round heating and cooling. Aluminum frames are available in all of our sunroom options and come in white, sandstone or bronze. Vinyl Sunrooms – Our vinyl extrusions are reinforced with an inner frame of aluminum or steel, which makes your sunroom structurally sound and able to meet or surpass local and national building codes. Vinyl is easy to clean and less likely to show wear, so it looks new for years to come. Vinyl frames are only available in four season rooms and come in white or sandstone color options. To determine which of our rooms best fit your unique needs, we created a side-by-side comparison chart that outlines the features of all of our sunrooms, so you can truly understand the differences between our products. Now that you are ready to begin planning your sunroom addition, how do you know which company to choose? At Patio Enclosures, we are sunroom experts. We not only install sunrooms, but we also design, manufacture, guarantee and service them as well. If you are looking for a one-stop shop that allows you to custom design your sunroom or porch enclosure, consider Patio Enclosures. 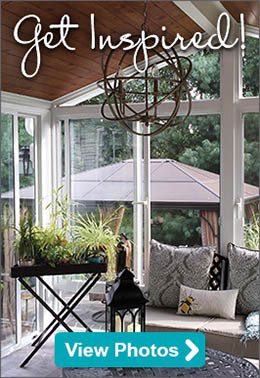 Are you ready to plan your perfect sunroom? Schedule your free, in-home estimate online, or call us at 1-800-230-8301 today!